Michigan takes down Wisconsin 14-7 in a back and forth defensive battle. Among the adages that we're all told in our formative years such as, "Beauty's only skin deep," and "Dad always gets the big piece of chicken." The one that most applies to today's match up between #8 Wisconsin and #4 Michigan would be, "Nothing worth having in this life comes easy." It was four quarters of knock down, drag out, old school Big Ten football. Somewhere Bo was sitting in a leather armchair and looking down on that one with a smile you probably couldn't even slap off a face. There were two defenses that everyone in the college football world knew were going to show up to play. Yards were gonna be tough to come by in the air, but even tougher to come by on the ground. The first quarter was a bit of a stalemate that saw only a couple big plays between two teams fighting for field position. The second quarter however, was a different story. The very first play was a 1 yard, Khalid Hill touchdown that broke the deadlock and put Michigan on the scoreboard first with an 11 play, 77 yard drive that saw some play calling that matched the old school feel to the game perfectly. The Michigan defense stopped Wisconsin on their next possession in convincing fashion to get the ball back in the hands of the clicking offense. Wilton Speight and Co. were moving the ball methodically towards what looked to be another touchdown drive, when suddenly, after a sweep left run play, there was another key Wolverine laying on the turf. Big number 77, Grant Newsome. 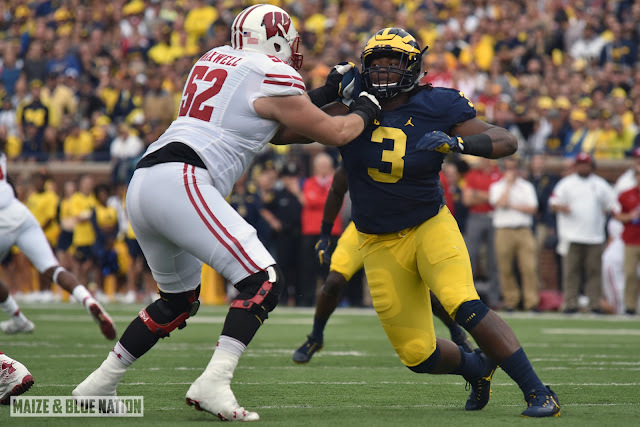 Who has been arguably Michigan's most dependable blocker on the O-line. When asked about the injury after the game Jim Harbaugh could only say that, "It's a knee injury that looks like it's going to require some type of surgery." The drive sputtered, and ended with a missed field goal. As good as Michigan's special teams have been up to this point of the season, there was one glaring deficiency that was exposed in today's game that we really hadn't had the chance to see yet with all the touchdowns that were scored in the previous games; and that's that their kicking game is not up to par with the other facets of the team. After Kenny Allen narrowly missed his first two attempts, Ryan Tice was brought on to attempt a third, and could not succeed in adding a much fought for three points to the Michigan lead. In the post game Harbaugh did state that there would be a serious competition in practice in the coming week to figure out who their kicker was going to be. When Speight was asked if the missed field goals had affected the team at all, he replied, "Anytime you leave points off the board, that's not on the kicker, that's on me as the quarterback and the offense to get the ball into the end zone." Adding, "It doesn't matter if we've got (Sebastian) Janikowski kicking, we need touchdowns and that's the bottom line." The third quarter saw a little bit of a momentum shift with Wisconsin capitalizing on the only interception that Speight threw all game. Scoring a 17 yard touchdown on a pass from Hornibrook to Ogunbowale, which tied the game at seven a piece. Both defenses remained calm and steadfast in their second half play, with standout performances from players on each team. For Wisconsin, the line backing unit lived up to the hype with Jack Cichy (12 tackles, 0.5 sacks, 0.5 TFLs), T.J. Watt (11 tackles, 1 sack, 2 TFLs) and T.J. Edwards (11 tackles) leading the charge. For Michigan, the standouts were without a doubt the two starting cornerbacks. Though outside of the 3 INTs they collectively racked up (Stribling with 2 and Lewis with 1) their stats weren't that impressive individually on paper, they (along with great safety play) held Hornibrook to just 88 yards passing, going 9 for 25. When Lewis was asked what we saw from Stribling today, he said simply, "You saw him, that's him. We've been seeing it since he got here in fall camp as a freshman."